The uninhabited very small island of Ilhas Desertas (local name Ilhéu Chão) is part of (the island group) Desertas Islands and is located in the country of Portugal, Southern Europe. The distance to the mainland is about 634 km. The nearest (main) land is Marocco and is not the country to which the island belongs. 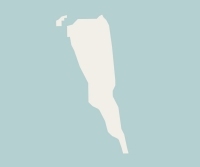 The surface-area of the island is 0.43 km2 and is therefore 0.001 x times greater than the island of Isle of Wight. The island lies in the Atlantic Ocean and the total coastal length is about 3.8 km and the dimensions of the island are approximately 1.5 km by 0.45 km (maximum width). The island is North - South oriented. The highest point is 98 meter. The coordinates (latitude, longitude) of the island (center) for GPS are 32.59 (32°35'7.2528), -16.54 (-16°32'39.5124). 1) Ilhas Desertas Located 7.5 km South of the island. 2) Ilhas Desertas Located 17.6 km South of the island. 3) Madeira Located 45.4 km NorthWest of the island. average score: No score from 0 votes.